Whiteley 2 Storey 180 design and has an ocean outlook to die for. 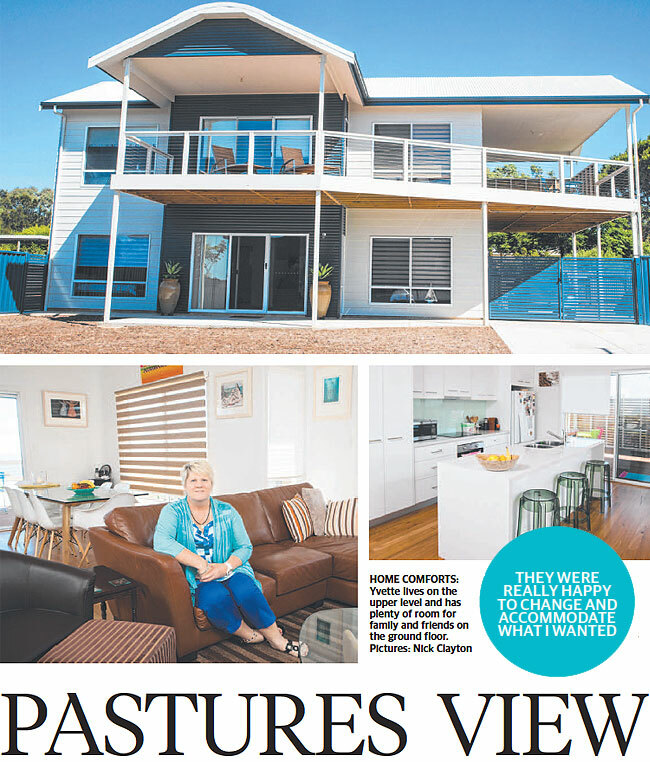 A two-storey by Sarah Homes designed to maximise enjoyment of the surrounding scenery including the ocean, was the obvious choice for Yvette Clark. That said, when the firsttime builder decided to build on a block in a seaside suburb, she did her homework. After researching what others had to offer over a couple of years, she decided to build with Sarah Homes, who had stood out from the start. "I had seen a couple of their houses when I was looking at beach areas" Yvette says. The first-time builder chose the Whiteley 2 Storey 180, albeit with modifications to suit her allotment which, while not on a beachfront, is positioned in such a way as to enjoy uninterrupted views. "I am one house back from the esplanade - my street is on a 90 degree angle" Yvette says, adding it therefore affords her sea views "through the streetscape". For that reason, Yvette asked Sarah Homes to build the Whiteley 2 Storey 180 - which is a popular choice for long, narrower blocks - "sideways". "They were really happy to change and accommodate what I wanted" Yvette says. Those modifications included making windows bigger, re-positioning one in the bedroom which was facing east to face north to make the most of the winter sun, and extending the balconies. "We also moved the front door from western to northern so that it is on the streetscape" Yvette says. She loves the home's upper level, which includes the master suite, ensuite, a separate powder room next to the stairs and a huge openplan living space which includes the kitchen. "As soon as I walk out of my bedroom I look across the lounge and dining area straight to the outdoor patio which overlooks the beach. I've got ocean views" Yvette says. "When I come home at night I don't have to go downstairs again, I live upstairs. "With three minor bedrooms, the laundry, three-way bathroom and a family room, the lower level has been set up for guests to enjoy. "I wanted a place where my family and friends could feel like they were having a beach holiday" she says. For that reason, and to make her home a place where she can also relax, Yvette chose polished concrete flooring for downstairs, in contrast to the floorboards upstairs, and a sky blue feature wall for the stairwell, both of which guests love. "I wanted a floor (downstairs) that would look similar to sand which was durable - I didn't want sand from the beach in the carpet or scratching the floorboards" she says. With its six-star energy rating, achieved through extra insulation and double glazing, Yvette is thrilled with her new home and doesn't hesitate when asked to name a favourite spot - the patio. "I can go out there and have meals, sit and watch the sunset with a glass of wine and relax" she says. "I would recommend Sarah Homes to my friends. For more information about the house in this story please look at the Whiteley 2 Storey 180.